This page will help you play RotMG with the stand-alone version of Adobe Flash Player, which is a program called “Adobe Flash Projector”. Using the flash projector to play reduces lag because Web Browsers usually have performance issues with RotMG. A video tutorial can be followed along with this post here. Kongregate users will have to follow some additional instructions in order to play on the Flash Projector, which can be found below. Please note that those who use Steam to play RotMG and wish to use the standalone Adobe Flash projector must contact Deca Support to link their Steam account to a web account. Please note you will need to know the answers to the 3 security questions that were set for your account when prompted previously in-game. Once you have your Steam Account linked to a Web Account, you can follow the normal steps below. Go to the Adobe support website and find the operating system you are using (Windows, Macintosh, or Linux), and click the “Download the Flash Player projector” link for the Operating System you are using. For Windows machines, the file needs no installation; once clicking the projector file, the projector will open. For Macintosh or Linux machines, Follow the instructions on-screen once opening the installation file to install the software. While other Flash projectors exist, there is no guarantee that they work or are safe. If someone links you to a projector and the link is pointing anywhere other than a page on adobe.com, you should not click the link and can assume they are attempting to have you install malicious software. If you use this, the only time you will have to update the URL is if the official root site for RotMG goes down. Kongregate users will need to simply visit the links above intended to be pasted directly into the Flash Projector with a Web Browser. Usually, simply visiting the page in a Web Browser from either link will download the client. In the unlikely event it doesn’t, try Ctrl + S.
Use this page to get the version number. As we continue, the instructions are assuming that you are using Windows, and that a SWF is saved in a folder named “RotMG” in the C: drive. Open your flash projector and in the top left corner left-click the word “File”, and then left-click “Open…”. This will bring up a window asking you to provide either a URL or destination for a local file. Copy one of the links listed above, and paste it into the box that appeared when you left-clicked “Open..”, and left-click the “OK” button. The game should load. If the projector just shows a empty white screen after pressing OK, then the website you tried is down. Refer back to the previous step for instructions on finding a different link. To access the game after you close it, just reopen the projector and left-click File to see a list of recently opened URL’S or Files, and click the respective one for RotMG. That’s it! 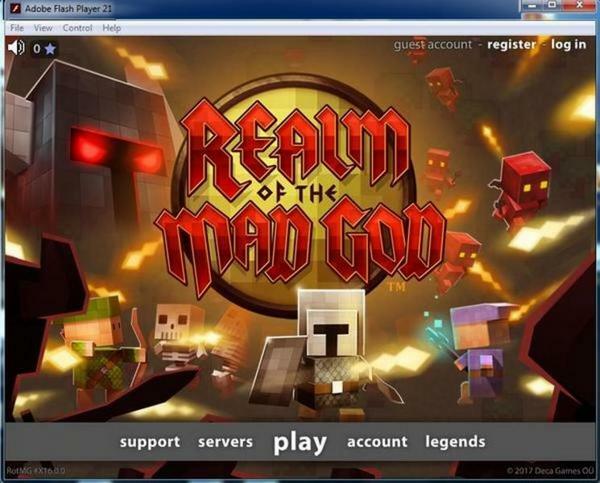 Enjoy playing Realm of the Mad God! Kongregate users should make sure that the Flash projector is able to open the .swf file that was saved in step 2. Copy and paste the file path to a text document. You will be adding more to it later. Press OK in Flash Projector to run the client. To solve the “d’oh, this isn’t good” error: Right click in the Flash projector window and select “Global Settings”. Click in the “Advanced” tab in the window that comes up and click on “Trusted Location Settings”. Add the folder that holds the saved .swf file as a trusted location. Restart Flash Projector and reopen the swf. It should now show the main game screen. Go to http://www.kongregate.com/games/Wild_Shadow/realm-of-the-mad-god and sign in to your Kongregate account. You’ll have to get the link Kongregate uses to connect to the game. The address includes the phrase “DO_NOT_SHARE_THIS_LINK” for a reason. Anybody who has this link can log in to your Realm account, so be careful. Press F12 in Windows to open the developer tools console, or right click on the page and select “Inspect element”. The console should appear at the bottom of the Kongregate game page. Select the tab at the top of the console titled “Sources”. You should see a box on the left (also titled “Sources”) which lists a number of site names. Near the bottom of that list “gameiframe” appears. Click on its arrow to expand it and reveal “realmofthemadgod.com”. Right click it and copy the link address. If using Firefox, Ctrl + Shift + K on Windows or Cmd + Opt + K on Mac (or right click on the page and select “Inspect element”) to pull up the developer console. Navigate to the tab at the top of the console titled “Debugger”. You should see a box on the left titled “Sources”. Scroll to find “https://www.realmofthemadgod.com “. A line saying “kongregate.html” should be below it. Right click on “kongregate.html” and copy the link address. Another method for Firefox requires Firebug. When Firebug is activated, click on the “CSS” tab of the window. Click on “realm-of-the-mad-god” to open that dropdown menu and scoll to the bottom and look for the line: kongregate.html?DO_NOT_SHARE_THIS_LINK=1. Click on that line. Enable the Develop menu (under ‘Advanced’ preferences) then launch the game on Kongregate. Put it in Cinematic Mode (not essential, but it makes it much easier to find the information), then right-click on the black frame of the game window and choose ‘Inspect Element’. This brings up the Web Inspector with the frame highlighted. Expand three times until you see the HTML body tag. Expand that and look for and copy the HTML containing the flashvars. The flashvars is the string you need to create the URL. Take it and replace all the HTML ampersands (‘&’ then ‘amp’ then ‘;’) with real ampersands (‘&’) to get the string that goes after the ‘?’ in your personal URL. Test it in a web browser to see if it works. You’ll probably want to save this path somewhere once you get it working, but try to keep it secure! You have to save the path because you’re forced to paste it in every time. Windows doesn’t like the long file name. When the game updates, you’ll have to download the new .swf and fix the path if you saved the .swf with a different name. No need to change the Kongregate account info. If you don’t want snoops seeing your account info through the recently opened files on projector, delete all the “RecentMovie” registry entries in HKEY_CURRENT_USER\Software\Macromedia\Flash Player. As it turns out, the way that the 64-bit versions of Ubuntu are set up is such that the 32-bit libraries of various programs aren’t there, and are instead linked to 64-bit versions of libraries. This is all fine and good, except when a 32-bit program is programmed badly: to depend directly on the 32-bit library. Such was the case for Flash Projector. The ia32-libs package is the one that is missing. The problem is that Ubuntu’s repositories for 64-bit distributions don’t have that package. It has similar packages, but Flash Projector demands that package. The solution can be found on stackoverflow. Essentially, you to add the repositories for an older version of Ubuntu to the list of software sources, install the old ia32-libs package, remove the repositories, clean up, and install gcc-multilib for a few more libraries. If it doesn’t work, you’re likely getting a shared libraries error. Search the library online. We’re going to have to make a .desktop file! This tutorial is for any X Window GUI interface, which covers the vast majority of normal users’ desktops. While I’m assuming this is for Flash Projector and therefore Realm, I’m going to write in a manner that you can follow regardless of the program you’re using. Name=Name of the thing that is displayed outward. Next, we need to make the new .desktop file executable. Do “sudo chmod +x /usr/share/applications/<name>.desktop” to add this property to the launcher. That should be all you’d need to do. You can copy it to other locations (like ~/Desktop) to put it there. 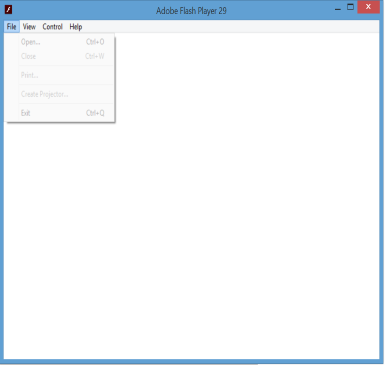 which opens up Flash Player (also in the /opt directory), grabs the latest AGC from Realmeye, and runs it. When you use Flash Projector in Windows, press Ctrl + Alt + Del (Ctrl + Shift + Esc in Windows 7) to open task manager, and set the priority of the projector to High. This should reduce lagspikes. This will allow you to see objects that are just slightly outside of the normal view.